Purchase this product now and earn 11,192 Reward Points! Tasteless powder is easily mixed into food or drink for ease of use. 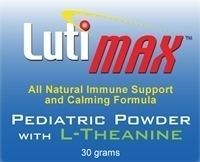 * LutiMax Pediatric Powder with L-Theanine is a 100% natural product from vegetables and green tea. Luteolin is a naturally occurring compound found in foods including parsley, artichoke leaves, celery, peppers, olive oil, rosemary, lemons, peppermint, sage, thyme, and many others. Caution: If you are pregnant, attempting to get pregnant, nursing, have a medical condition, or you are taking drugs such as amphetamine, methylphenidate, or anti-seizure medications, consult your doctor prior to using this product. Luteolin is fundamental to vitality.